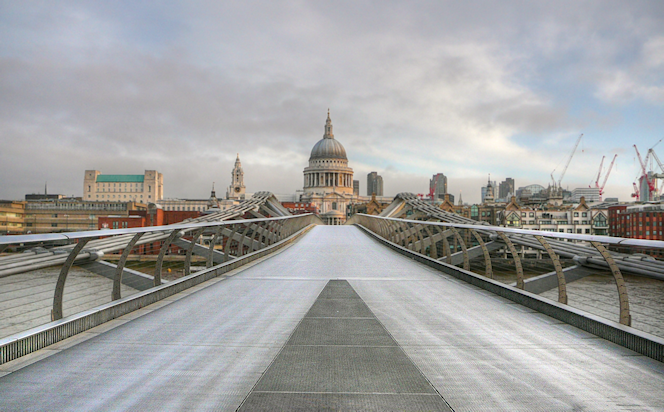 The London Millennium Footbridge crosses the Thames between St Paul’s Cathedral and Tate Modern. Its architect, Lord Foster, likened the styling to a ‘blade of light’. The structure exhibited unexpec­tedly strong oscil­la­tions when subjected for the first time to heavy usage after it opened in June 2000. The effect was amplified when pedes­trians subcon­sciously (and in some cases delib­er­ately, after the problem was discovered) responded to the movement by swaying as they walked, a phenomenon known as synchronous lateral excit­ation. The bridge was closed while £5 million was spent on retro-fitting shock-absorbing dampers. This success­fully eliminated the oscil­la­tions but has failed to entirely expunge the nickname ‘the wobbly bridge’. The bridge exhibits an extreme degree of wobbliness in the film Harry Potter and the Half-Blood Prince (2009), in which it is attacked by Lord Voldemort’s Death Eaters.